A pointer in the C programming language plays a very important role, but if we are not used pointer properly then they create some crucial issues. In this article, we will discuss the bad effect of pointers. Before start discussion on the dangling pointer, let's take a look on, how the pointer is allocated in memory? 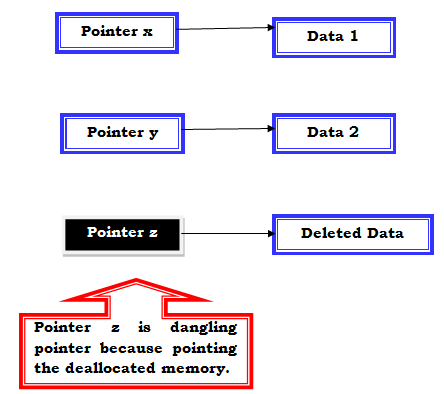 A dangling pointer is created when data is deleted from memory but pointer still points to that memory location (as shown in Figure 2). An issue is created because pointer still pointing to the memory which is not available. When the programmer tries to dereference the dangling pointers that it shows undefined behaviour and can be the cause of the segmentation fault. A pointer (dangling pointer) which is not pointing to the valid memory location can be the reason of undefined behaviour. 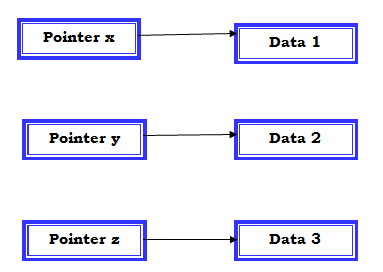 In the above figure, pointer x and pointer y pointing to valid memory data but pointer z is pointing to a memory which is deallocated. So, pointer z becomes a dangling pointer. but when you will try to access the pointer z then you will get the undefined error. There a lot of reason due to the dangling pointer is created. In this section, we will discuss the causes of a dangling pointer. When a local variable is declared or initialized within a block then memory is allocated to the local variable. That memory is deleted or freed when it comes out of the block. In the C programming language, malloc, calloc and realloc library function are allocates memory during run time and free is used to de-allocate memory. Combat combination of malloc, calloc, realloc and free generate the dangling pointer. Whenever the user tries to access the freed memory then you will get the segmentation fault. How to avoid Dangling pointer? The generation of the dangling pointer is avoided by user or programmer if they use NULL explicitly after freeing the dynamic memory. Another factor which creates the dangling pointer is to not return the address of the local variable from the function. This can be solved if we are using the static variable because the lifetime of the static variable is throughout the run of the program. // Now p is Not a dangling pointer as it points to static variable. In this article, I tried to clear all the concept related to a dangling pointer, but I would love to know about your views. So, Please write your comment in the comment box.